In this guide we’ll take a look at the best gas BBQs for the UK market! What Is The Best Gas BBQ? 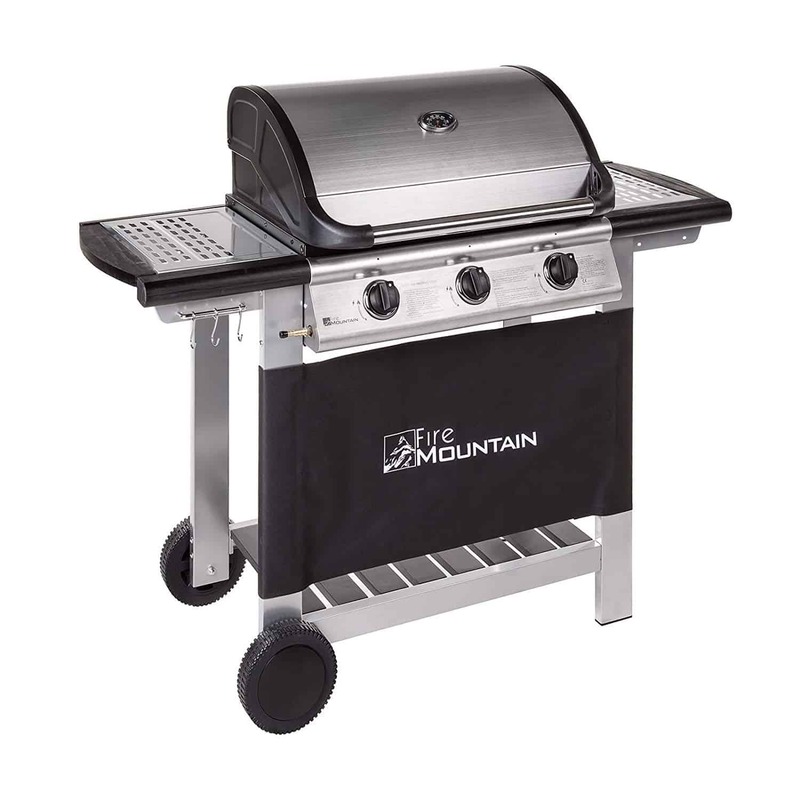 This Fire Mountain 3 Burner Gas Barbecue is a quality BBQ which features a modern design and quality materials – all packaged up in a very reasonable price. It’s my first place winner for the best gas barbecue out right now! It is practical in the sense that it has a large area dedicated to cooking, which makes it easy to cater for large families and even for the occasional party. It also comes with a host of features which make grilling quicker and therefore more enjoyable. The three burners are made out of premium cast iron and are powerful, burning at 12,000 BTU each, giving you a full 36,000 BTU of cooking power at your fingertips. Even the thickest of burgers and steaks will be cooked easily and in as little time as possible. The piezo ignition also gives you the convenience of knowing it’s going to work each and every time. The extended cooking area includes a cast iron griddle and grill, and the drip tray below captures all the drips and fat in one place. It is also removable which makes cleaning extra easy. The pull down hood has a built in temperature gauge to make roasting your food simple, and also features a handy warming rack. The two useful side shelves are ideal places to keep plates or cutlery whilst food is being prepared. Overall this gas barbecue offers incredible value for money, and is packed with high quality features. It wins my vote as the best gas BBQ on the market! This Outback Excel 310 Gas Barbecue 2017 Model is a smaller BBQ, but what lacks in size it certainly makes up for in looks, with a stunning sleek, silver and grey finish which will look at home on any patio or garden. This outback gas BBQ comes with two burners under the main grill which are controlled separately, as well as a separate side burner which can take a saucepan, ideal for preparing sauces, stir fries or other BBQ accompaniments. This gives you the flexibility you need when preparing outdoor meals. The main cooking area offers a space of 50 x 38 cm and can be covered by a hood which comes with its own built in temperature gauge. This accompanies the built in warming rack which runs the length of the hood, which can be used either for keeping food warm or for roasting. The grill itself is coated in porcelain which has been proven to retain heat more effectively than metal alone, it has also proved far easier to keep clean. This outback gas BBQ comes complete with lava rock supplied, which not only gives it a more authentic feel, it also increases and retains the heat more effectively. This model is a great example of one of the best gas bbq products on the market right now. It will cook up a storm for any summer party! This Outback Omega 250 Gas BBQ is a small, yet practical gas BBQ, with a striking appearance in a stylish black finish. It would make a great addition to any garden, large or small. An attention grabbing feature of this outback gas BBQ is the handy side burner which makes it even more versatile than most. You could be grilling your burgers to perfection whilst your fried onions are ticking over nicely on the burner. The fold down side table on the other side keeps the BBQ symmetrical but is also a practical space to store food before or after it is cooked. Or even a practical place to put your buns ready for those burgers with onions! The hood is a one piece, long lasting design and can withstand high temperatures even when closed, to provide you with the opportunity to roast your food. The burners are aluminised and dual controlled, allowing you to have two cooking zones at different temperatures. The cooking grill If you are looking for a gas barbecue that has been designed to last a lifetime then this might be the best gas BBQ for you. The Outback brand name has become synonymous with classic design, sturdy structure and fantastic reliability when it comes to home BBQs, and this three burner offering is no exception. The Outback Hunter Plus 3-Burner Gas Barbecue BBQ has three burners made of long lasting cast iron. These are backed up by the supplied lava rock which give you the highest possible heat output, as well as guaranteed longevity and overall improved cooking performance. The grill and griddle are also cast iron, coated in a matt black porcelain which not only prevents rusting, it also makes it easier to clean after cooking. The griddle is multifunctional, it can be turned over and used as a flat surface that’s perfect for frying eggs. Within this outback gas bbq there is a warming rack that swings away with the hood, ensuring that the overall cooking space is maximised whilst still providing space to keep food warm. The hood itself is porcelain coated and protected from heat and acid corrosion as well as being weatherproof on the exterior. With the hood closed you can roast or bake as well as carry on grilling. With the burners off you can even maintain heat inside for up to 30 minutes. The BBQ is finished off with an extra saucepan burner on the side. 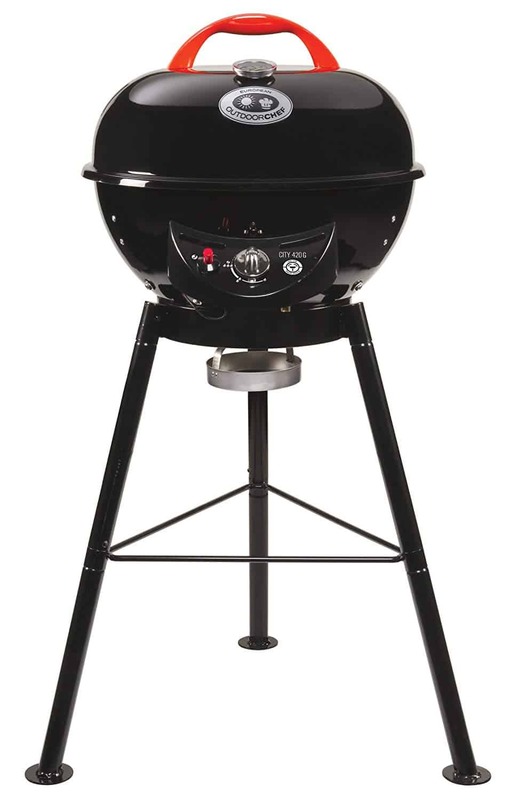 This Outdoorchef City 420 Gas Kettle has the look of a classic kettle shaped charcoal BBQ and it is a really easy to use gas BBQ. I personally think it’s the best gas barbecue for compact spaces. It is a small design, purposely compact to fit into tight spaces to suit even the littlest of outdoor areas. It has one burner, the heat from which can easily be controlled using a sensitive dial on the front of the unit. Next to this dial is the piezo ignition button, making lighting this BBQ as easy as turning on an oven. There is an integrated and rotatable flip funnel, which makes both direct and indirect grilling particularly easy. This is a feature that helps with every conceivable BBQ cooking challenge as it avoids flare ups and allows foods to be gently cooked. This gives you peace of mind that there aren’t going to be any unexpected flames as well as ensuring the food’s cooked to a healthy perfection. The design of this BBQ means that it is both easy and quick to assemble straight out of the box. It is fitted with a 37 MB gas regulator so is ready to use as soon as it is assembled. For ease of use and practicality, this is my choice for the best gas BBQ for small gardens. This CosmoGrill 6+1 Gas Burn Grill BBQ gets its name from the six stainless steel burners, all of which are fully adjustable, giving you one of the most controllable BBQs on our list. An individual piezo ignition button for every burner ensures that each one is easily lit, for a quick start BBQ as well as an energy saver, only lighting which burners you need to use. Flame tamers come as standard, these sit below the grill and over the top of the burners. These are multifunctional. They keep the burners clean from any food drips but also vaporise the drips to give you the flavoursome smoky effect that BBQs are so popular for. The hood is made from double walled aluminium. Having a tough hood is essential for a gas BBQ as closing it when lit helps you raise the temperature at a much quicker rate. It also gives you the option to roast or bake your food. There’s a built in thermometer too so you know what’s going on inside without the need to open it and lose the heat. Cleanliness is also at the forefront of this design. The grease pan captures everything that drops from your food and is then easily removed and cleaned. If you are looking for the best gas BBQ that features a large capacity then this might just be the ticket! Up next we have the Charles Bentley 7 Burner Premium Gas BBQ, and it’s the best gas BBQ for anyone who takes their outdoor cooking seriously. It is a versatile and premium level gas BBQ that is perfect for large families or for regular party catering. Each of the six main burners can be individually lit, giving you the opportunity to create numerous temperature zones across the BBQ, enabling you to cook many different dishes at the same time. This gives you a large and adaptable cooking space on its own, but there is also an additional side burner which can be ignited separately and controlled. There is a warming rack which runs along the full width of the BBQ and the temperature inside can easily be maintained when the hood is closed thanks to the built in thermometer. The hood is double layered and keeps food warm for up to 30 minutes after the BBQ has been switched off. Other conveniences included with the BBQ include a side table for food preparation and a removable drip tray to make cleaning as easy as possible. The BBQ is completed by double door storage space underneath, which includes three hooks for hanging utensils and even a sauce rack. The BBQ is easy to manoeuvre too, with four wheels, a side handle and a brake to provide stability. This Fire Mountain Elbrus 3 Burner Gas Barbecue is a classically designed gas BBQ with its stand out aesthetic feature being its smart wooden frame. This ensures it fits in nicely with any traditional garden decor. This BBQ provides a large cooking area making it an ideal choice for families or the occasional outdoor get together. It also comes complete with a range of extras to make outdoor cooking as enjoyable as possible. There are three individually controlled burners, allowing you to create three different temperature zones. Each one can also be ignited separately and easily using the electronic piezo ignitors. The grill and griddle are manufactured from cast iron and there is a drip tray underneath to capture any spills. This tray is also removable making cleaning up afterwards very easy. The dome shaped roasting hood is manufactured from steel and powder coated for long lasting protection. It includes a handy temperature gauge as well as a warming rack inside. This makes it easy to keep food warm at a desired temperature. There are two side shelves which are handy for food preparation or for plating up and there is also a low shelf behind the fabric, giving space to store the gas bottle when not in use. If you love modern design and are looking for something completely different in your BBQ then this futuristic and highly unusual model will capture your attention. It has been designed by the former chief designer at Apple and has won awards for its looks, so you won’t be alone at being impressed. The Fuego F21C 2016 Model Carbon Steel Gas Grill BBQ is incredibly functional as well as being great to look at. It can heat up to 250 degrees celsius in just five minutes, and up to 350 degrees overall. Coupled with the cast iron grates, coated in porcelain enamel, this gives you perfect results when it comes to searing meat and veg. An overall cooking area of 2,230 cm2 fits handily into an overall footprint of just 54 cm x 54 cm, meaning that it can fit into the smallest of areas, making it an ideal choice for just about any garden. The Fuego Element weighs a hefty 41 KG but is easy to move around thanks to the sturdy wheels on the bottom. These allow you to move it around safely, even when it’s lit. The gas bottle fits snugly inside the unit itself, maintaining the sleek appearance. The flames are easily controlled by a sturdy knob on the outside of the unit. There are two grill rings, and you can choose to use both or just the outer one, according to what you need. This award winning gas barbecue is an incredibly feat of engineering. Although its pricey, it’s clearly one of the best gas BBQ models available for the UK market. If you like to keep your BBQ cooking as simple as possible then you might want to consider this value for money offering from the well known and well respected BBQ manufacturer, Landmann Grill. 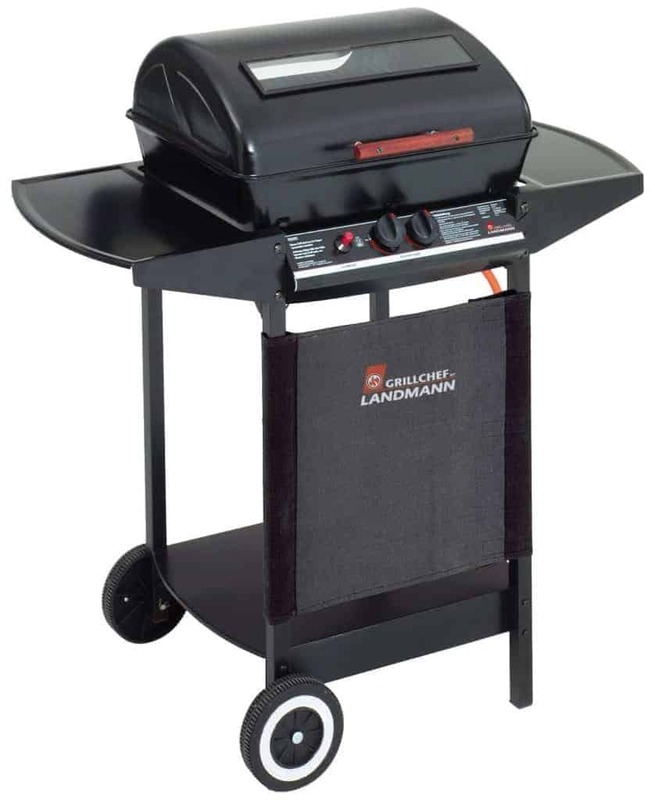 This Landmann Grill Chef 2 Burner Gas Barbecue comes with a two stage gas control, allowing you to accurately control the temperature on both sides of the cooking area. This gives you the flexibility to be able to cook two different types of food at once. The burners themselves are made out of durable steel and are covered with flame tamers to keep them protected and your food safe from scorching. The cooking grill supplied is chrome plated and the lid on the BBQ can be closed to allow effective roasting of food. A handy viewing window is also included so you can make sure your food comes out perfect every time. This model comes supplied with the required gas hose as well as the regulator and is designed to work with propane gas. As expected from Landmann, this BBQ has a practical and functional design and is made from materials that are sturdy, whilst at the same time being lightweight. This is a model that will suit the occasional outdoor griller as well as the expert. There’s nothing better than stepping outside and smelling the delicious scent of succulent burgers sizzling on the BBQ. There’s also nothing worse when you realise that smell is coming from your neighbours! So if you love the idea of a spontaneous BBQ, and don’t want the faff of waiting around for it to heat up, a gas BBQ is the way to go. I own the Outback Hunter 3 Burner, and I have to say, it’s served me very well the past two summers. But there are also some great models that have spiced up the market since! The above list shows a range of high quality gas BBQs, all providing you with the same end result, but each one offering something a little different. In order to decide which one is right for you, think about the following two considerations. Size – If you’re cooking for a family of four, then a gas BBQ with as little as two separate burners should be big enough for you to be able to cook enough food for everyone. If you like to entertain and regularly cater for many more people then you are going to be needing something a little bit larger. This is both in terms of the cooking area and the overall number of burners provided. Extra Features – The best gas BBQ models will include features such as storage, food preparation, extra cooking space and easy cleaning. If you buy a large BBQ then you may have storage space underneath, but the storage space alone shouldn’t influence your decision. Most of the BBQs above will come with one or two side tables, these are handy for food preparation and for plating up. With regard to extra cooking space this primarily refers to an extra side burner for use with saucepans or pans. These are very handy for preparing accompaniments such as beans, onions or sauces in the same area. These are a feature on a number of the BBQs above so you will need to decide if this is something you will use. Warming racks are handy features and are normally found in BBQs with hood shaped lids. These keep food at a certain temperature but can also be used for roasting and baking, with some hoods also featuring handy built in thermometers. Again, is having a BBQ with a temperature gauge going to stop you preparing certain things in a conventional oven? A gas BBQ is an obvious choice for ease of use and for quickness to get started, when compared to a charcoal BBQ, and these are the two things to consider when making a choice as to which gas BBQ to buy. BBQs that are quick to light, have the desired features that are going to make your life easier as well as being the right size for what you want to use it for are the things to think about. A selection from the above BBQs will guarantee an enjoyable outdoor cooking experience for years to come.